The New Redmi Note 3 is launched, Htc released a video recently. Here is How to Root Redmi Note 3 with various methods. There are two variants of the Redmi Note 3. One is 32 GB model which we will call Kenzo and 16Gb will be named Hennessy. All you need to download these files to your computer, all files are required in the process to root the redmi note is global version. EDIT 1: If you get a problem like "unable to flash img" it means your phone's bootloader is locked. Use this Application to unlock (china language but it's simple) the bootloader first. or use the official site to unlock it. Download that are needed. Links are below. #1. Fastboot Zip - It will establish a connection that will connect your Redmi Note 3 and Computer. #2. Twrp Recovery(16GB) Twrp Recovery (32GB) - This will help to install the SuperSu and other Custom Roms. #3. Supersu Zip - The mascot of root manager. #4 ADB Driver (If not installed on your computer). Installing SuperSu with TWRP recovery. Step 1. First, extract the Adb zip, on your Desktop and put your downloaded TWRP recovery img file in the same folder, Don't forget to rename the TWRP recovery file to just "twrp" For ease. Then your folder will look Like this. (ii). Copy the SuperSU zip to your redmi Note 3's internal storage or in SD card. Extra Step. Enable USB debugging on the device. Step 2. Boot your Phone into Fastboot Mode. Now you need to Switch off Redmi Note 3 and start it by pressing Power + Vol. Down button → it will open fastboot mode. (You will be robot with some sort of machine). Next, you have to take a USB cable and Connect the Redmi Note 3 to a computer. Next step is important, follow it carefully, Open the folder which you created earlier on your computer Desktop. In the white are Press SHIFT + Right mouse click and select "Open command windows from here" option. This will open a Command Prompt window. Step 2. 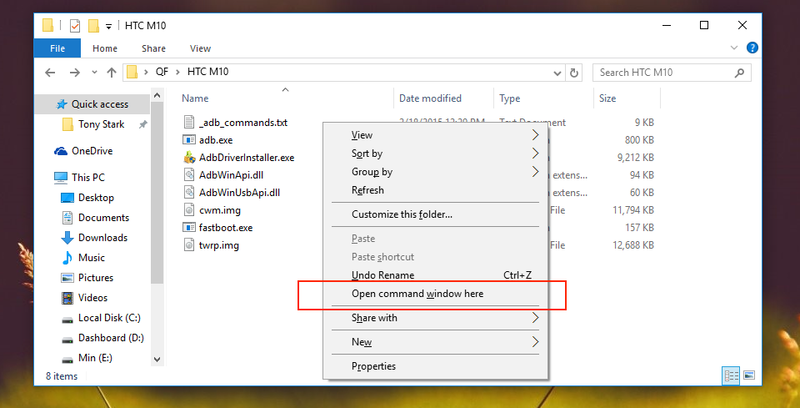 Make sure your computer has working fastboot and adb, for that type this command as soon the Command Prompt windows will open. If you see your device's number, typically you will see some numbers, then everything is right until now. If you do not see anything, You need to download ABD installer (#4), if you do not have on your computer. Wait for some moments, and you will see cannot message. Right now your phone will auto opens the twrp recovery menu. Next tap on install → locate SuperSu zip → Flash it → Reboot phone. You now have a rooted M 10 phone. Find Root apps to install to unleash the power of Android. TIP 1. To permanently install TWRP recovery type this command, "fastboot flash recovery twrp.img". This is not recommended because you just further repeat steps to access into 'twrp menu' and install something like Custom Roms etc. Download iRoot and install it on your Windows computer. After open installation iRoot and connect your Redmi Note 3 with a USB cable to your PC. Now click on ROOT button and wait for some time for results. There is a 90% chance to root successfully with this method. You can also try to root your Redmi Note 3 with KingoRoot; the process is similar. Install Kingo Root app. (Not recommended). → Download the KingoApp application from its official site. After downloading introduce the application. Ensure you are associated with the Internet, because the application brings workaround from its servers. It's distinctive for each telephone. → If you are fortunate, you will get a message saying 'root can be conceivable' regardless of the fact that you didn't get the message, doesn't mean you can't root Redmi Note 3. → Click on root now catch, it'll take a few minutes to finish. Toward the end it'll demonstrate a message either effective or not fruitful. On the off chance that you are established, you can utilize these android apps specifically for rooted android. This was about rooting RedmI note 3 at your home. However, there are much more to discover such as unleash your android phone power. That's all we know. we'll also update this post if we found an easier method to root Redmi Note 3 device.